Lots of museums these days have video comment booths to invite visitors to tell their stories, but how many of those booths really deliver high-impact content? Last week, I talked with Tina Olsen, Director of Education and Public Programs at the Portland Art Museum, about their extraordinary Object Stories project. They designed a participatory project that delivers a compelling end product for onsite and online visitors… and they made some unexpected decisions along the way. How and why did Object Stories come to be? The project arose from a grant announcement from MetLife Foundation around community engagement and outreach. I knew I didn’t want to do something temporary—a program that would last a year or two and then go away. And I also knew we wanted to connect with the Northwest Film Center, which is situated in the museum. There hasn’t been a history of collaboration between the museum and the film center and we wanted the chance to partner more deeply, and build a platform where we could continue to do so. In the education department, we have some key values around slowing down, conversation and participation around art, and deep looking. And so this concept of asking visitors to spend some focused time thinking about their relationships with objects and artworks really made sense to me. Also, on a personal level, I had this really powerful experience with my mother in a Storycorps booth in Grand Central years ago that had a profound impact on me. She had revealed things I’d never known, and I kept coming back to it. There was something in there that I wanted to play with in a museum concept. What did you end up with and how did you get there? Our first notion was all about something mobile, something that would go out to the community. We imagined an cart at the farmer’s markets where people could record stories. But we couldn’t figure out how we were going to sustain that with our staff. We ended up with a gallery in the museum instead. It’s in a good location, but it’s also kind of a pass-through space to other galleries. It has a recording booth that you sign up in advance to use, and you go in and tell a story about an object that is meaningful to you. The other parts of the gallery are for experiencing the stories, and for connecting with the Museum collection. 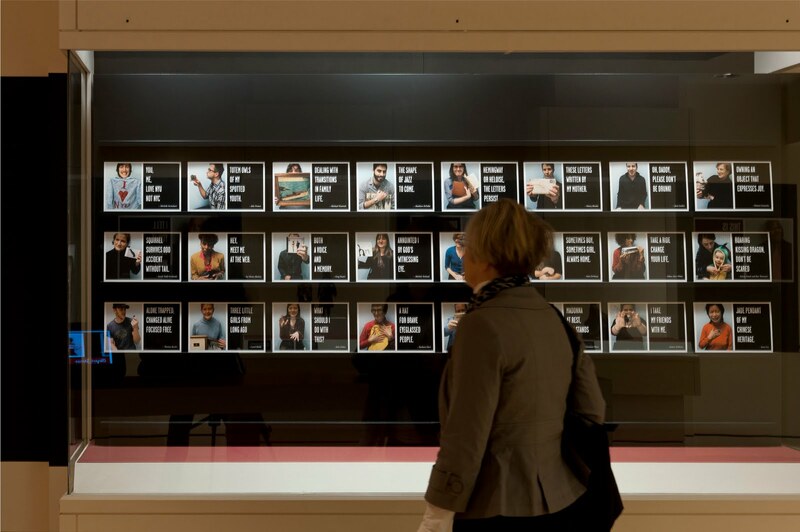 We have cases with museum objects that people told stories about, with large images of those storytellers adjacent to the object, and in the middle of the gallery is a long rectangular table with touchscreens where people can access all the stories that have been recorded. 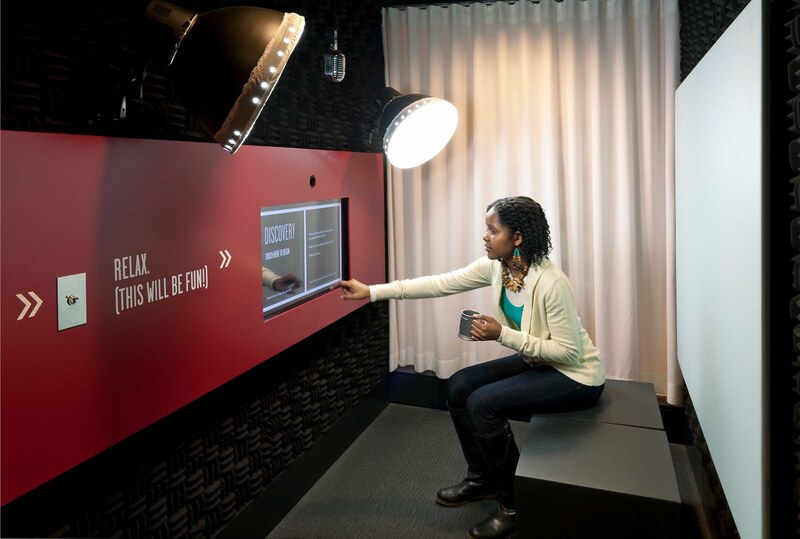 Your recording booth asks participants for audio stories plus photos of themselves with their objects. Why did you choose this format instead of video? We had planned on having it be video. The proposal to Metlife was all video. Then we started working with our local design and technology firms—Ziba Design and Fashionbuddha—and in the prototyping, it became clear we had to go another way. We partnered with the Film Center to conduct workshops with community organizations around personal object storytelling. These really informed the project, and helped get the word out about the gallery. We rigged up a video recording booth in Fashionbuddha’s studios. We found people would go in, do their story, come out, say it was so powerful and cathartic, but then the videos would be really bad—boring, too long, unstructured. They were often visually uncomfortable to watch. And some participants were turned off by the video recording—they found it too scary, and being on camera distracted them from telling their story – especially older people. We came up with a system that was much more structured and is based on audio, not video. In the current setup, you walk into the booth, all soundproofed and carpeted, and then you sit down on a cozy bench. You can come alone or with up to three people. You face a screen, and the screen is close enough to reach out and touch without getting up. The screen prompts you, with audio and with words, and it’s in both English and Spanish, because we really wanted to reach out to the Spanish-speaking community in Portland. There are five prompts that follow, and for each, you get 45 seconds to record a response. Each of the prompts was really carefully written and tested to scaffold people to tell a great story. People don’t necessarily walk in the booth knowing how to do that. For example, the first prompt, which is about discovery, asks, “When and how did you first receive, discover, or encounter your object? What was your first feeling or impression of it? Who was there?” This prompt really gets people sharing specifics, sharing details—the things that make a story successful. Another good example is the final question: “If you had to give it to someone, who would it be and what would you say to them?” This question really makes people focus on the meat of what’s important about their object, and it’s a natural summarizer… but in an interesting, personal way. After you record your audio, you get to take the photos and give your story a six-word title. We experimented with when in the process to take the photos, and it’s nice at the end—it’s a kind of reward. The recording is often very intense—people cry, it takes something out of them. Photos are fun. We prompt participants to hold the object in different ways: close to camera, pose with the object in your lap, hold your object as close to your face as possible, hold it in profile. How do you edit the stories? Fashionbuddha built a backend content management system where you can choose audio segments, reorder them, and choose photos. This is made to be sustainable with current staffing– while we have the ability to edit within a 45 second chunk, 99% of the time we don’t do it—we just pick the segments and photos we want to use and put them in order. The gallery also features objects from the museum’s collection with people’s stories about them. Who are the people who record stories about museum objects? That is more curated. The first testing we did there was very much the same as Object Stories – anyone could sign up and get involved, pick an object in the museum and tell a story about it. Those stories were, frankly, often very banal. There was an imbalance between stories with people’s own objects, with which they have profound relationships, versus museum objects that they might come see once or twice and like, but not really have a deep connection with. So we realized we had to have an equivalence–the museum stories had to be profound too. And it couldn’t all be curators, but these storytellers had to be people who had profound relationships with museum objects. We have four stories up now: from a guard, a curator, a longtime museum lover, and an artist. In the future, I’m thinking of really mining our membership, putting out a call to them, building some programs that might help us seed and support the museum stories. The website for the stories is beautiful. You also got some prime physical real estate for this project. How did you get the gallery? That was really hard-won. At first, it was going to be a little booth tucked away somewhere. As the project progressed, our prototyping showed us we didn’t want a shallow experience–a photo booth where you could just drop in and do it. We wanted something where people could spend the time and focus deeply on the experience at hand. That required more space. And it was really important to the director and to me that Object Stories connected to our mission and to our collection. That led me to feel strongly that we needed to have museum objects in the space. It couldn’t be an educational space with no works of art in it. I wanted to integrate this experience into what you do in the rest of the museum. We ended up with a very multi-departmental team, and that helped too. The big goal is to activate your connection with objects in the rest of the museum, that Object Stories models the idea of having deep relationships with objects for any visitor who comes in. 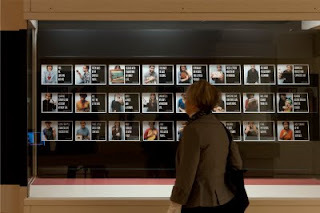 What do you know so far about the non-participating visitors to the gallery? I only know anecdotally. People are really entranced with the stories, browsing them on the touchscreens, and with the museum objects as well. They even spend a long time looking at this big case we put up that just features 8×10 cards with photos of people with their objects. I was surprised at how long many visitors will spend at this case. It’s just graphics. Why would people look at that? I think it may be because people are visually included in the space, and that’s rare in an art museum. They’re very interested and maybe even moved by it. You can browse stories online and sign up to record one at objectstories.pam.org. Object Stories is funded by the Metlife Foundation, the Kress Foundation, the Lehman Foundation, the Oregon Arts Commission, and the PGE Foundation. Thanks to Tina for sharing the story of this fascinating project. Tina will be monitoring the blog and responding to your comments over the coming week. This entry was posted in Art and tagged Capture, Christina, Compelling, Interview, Olsen, Stories, Visitor. Bookmark the permalink.